Thirty-2 Advanced Dentistry is currently open for business and has a fabulously lavish grand opening celebration planned for February 22nd from 5:30-8 pm at their office on Santa Monica Blvd in West Hollywood. The event is open to the public and will include a ribbon cutting ceremony, after-party and entertainment by LA Photo Party. West Hollywood’s newest dental office, Thirty-2 Advanced Dentistry, is where science, luxury and comfort come together at a competitive price. Designed by Marco DiMaccio, Thirty-2 Advanced Dentistry is worlds apart from other dentists’ offices. Patients are greeted by a 16 foot chandelier and flat-screen televisions in the luxurious and opulent reception area. Antique mirrors line the hallway to the consultation rooms where patients can relax in heated massage chairs while watching their favorite shows on large, flat-screen televisions. 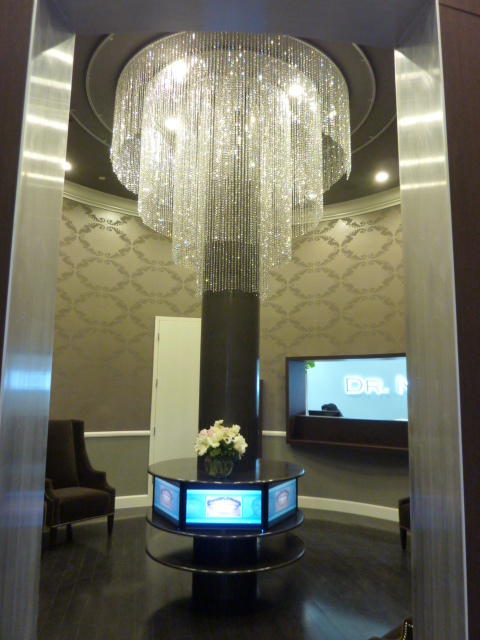 Only Thirty-2 Advanced Dentistry’s dentists and technologies are more impressive than the interior design. Dr. Naz, owner and primary dentist, focuses on full-mouth care, not just teeth. Dr. Naz will manage each patient’s dental care and will orchestrate treatment with her team, comprised of the most qualified dentists and specialists for cosmetic surgery, pediatric dentistry, periodontology, endodontics, and general dentistry. Thirty-2 Advanced Dentistry offers a number of services including power bleaching, dental implants, Invisaline, porcelain veneers, biocompatible composites, the safe removal of mercury fillings and more. Thirty-2 Advanced Dentistry is located in West Hollywood and accepts most health insurance plans. It is owned and operated by Dr. Farnaz (Naz) Tofigh, a licensed dentist who has 19 years of experience and is a member of the American Dental Association.